The industry-leading Sentence Correction Guide delves into every major principle and minor subtlety of grammar tested on the GMAT. From its comprehensive list of GMAT-specific idioms to its tailored coverage of topics such as pronouns and parallelism, this guide teaches exactly what students need for GMAT Sentence Correction—and nothing that they don’t. Unlike other guides that attempt to convey everything in a single tome, the Sentence Correction Strategy Guide is designed to provide deep, focused coverage of one specialized area tested on the GMAT. As a result, students benefit from thorough and comprehensive subject material, clear explanations of fundamental principles, and step-by-step instructions of important techniques. In-action practice problems and detailed answer explanations challenge the student, while topical sets of Official Guide problems provide the opportunity for further growth. Used by itself or with other Manhattan GMAT Strategy Guides, the Sentence Correction Guide will help students develop all the knowledge, skills, and strategic thinking necessary for success on the GMAT. 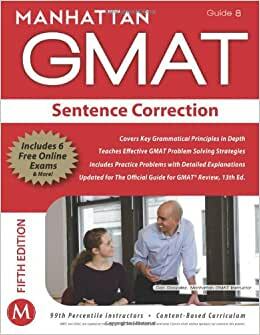 Purchase of this book includes one year of access to Manhattan GMAT’s online computer-adaptive practice exams and Sentence Correction Question Bank. 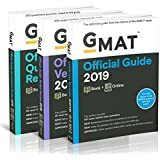 All Manhattan GMAT Strategy Guides are aligned with the 13th edition GMAC Official Guide. In the last decade, Manhattan GMAT has grown from a single, dedicated tutor to a major test prep company with locations across the US and internationally. Manhattan GMAT hires fewer than 1 in 10 qualified applicants for its teaching positions, ensuring every instructor has years of experience and a 99th percentile score.